Estimate the total and filled volumes of tanks such as oil tanks and water tanks. Assumes inside dimensions of the tank. *Actual fill volumes will differ. Tank volume calculations are based on tank geometries shown below. These tank shapes are calculated assuming exact geometric solid shapes such as cylinders, circles and spheres. Actual water and oil tanks may not be perfect geometric shapes or might have other features not accounted for here so, these calculations should only be considered estimates. 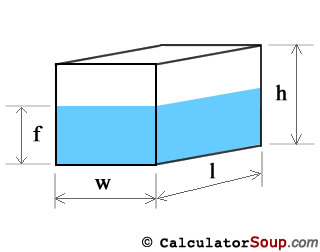 Methods to calculate the volume of tanks and the volume of a liquid inside a tank. These calculations will give you cubic measures such as ft3 or m3 depending on your units of measure. 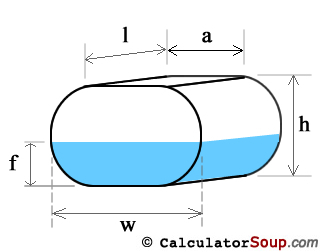 Calculate the filled volume of a horizontal cylinder tank by first finding the area, A, of a circular segment and multiplying it by the length, l.
Area of the circular segment, the grey shaded area, is A = (1/2)r2(θ - sinθ) where θ = 2*arccos(m/r) and θ is in radians. Therefore, V(segment) = (1/2)r2(θ - sinθ)l. If the fill height f is less than 1/2 of d then we use the segment created from the filled height and V(fill) = V(segment). 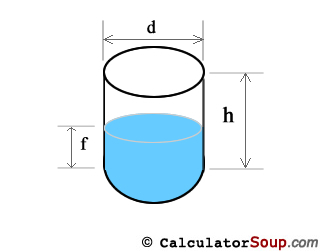 However, if the fill height f is greater than 1/2 of d then we use the segment that is created by the empty portion of the tank and subtract it from the total volume to get the filled volume; V(fill) = V(tank) - V(segment). Volume of fill of a horizontal oval tank is best calculated if we assume it is 2 halves of a cylinder separated by a rectangular tank. 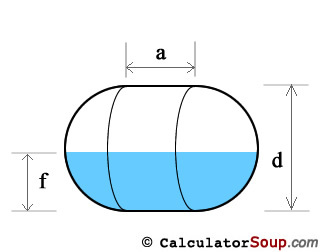 We then calculate fill volume of 1) a Horizontal Cylinder Tank where l = l, f = f, and diameter d = h, and 2) a Rectangle Tank where l = l, f = f, and rectangle width w is a = w - h of the oval tank. To calculate fill volume of a vertical oval tank it is best if we assume it is 2 halves of a cylinder separated by a rectangular tank. 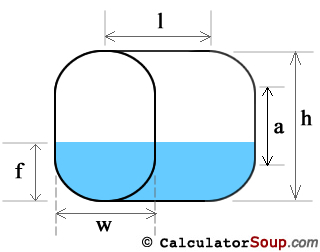 With r = w/2 = height of the semicircle ends, we can define 3 general fill position areas. We calculate fill volume using the circular segment method, as in a Horizontal Cylinder Tank, for the filled portion. The filled volume is exactly 1/2 of the cylinder portion plus the volume of fill inside the rectangular portion. We calculate fill volume using the circular segment method, as in a Horizontal Cylinder Tank, for the empty portion. Volume will be V(tank) - V(segment). We treat a capsule as a sphere of diameter d split in half and separated by a cylinder of diameter d and height a. Where r = d/2. 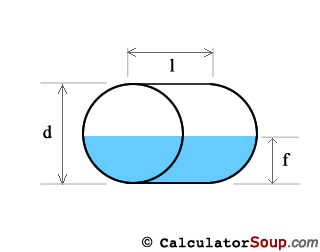 To calculate the volume of a vertical capsule tank treat the capsule as a sphere of diameter d split in half and separated by a cylinder of diameter d and height a. Where r = d/2. 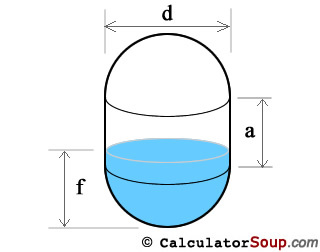 To calculate fill volume of a vertical capsule calculate in a fashion similar to the method used for the Vertical Oval Tank where r = d/2 = height of each hemisphere end. We calculate fill volume using the spherical cap method, for the filled portion. The filled volume is exactly 1/2 of the sphere portion plus the volume of fill inside the vertical cylinder portion. We calculate fill volume using the spherical cap method for the empty portion. Volume will be V(tank) - V(spherical cap). Furey, Edward "Tank Volume Calculator"; from https://www.calculatorsoup.com - Online Calculator Resource.